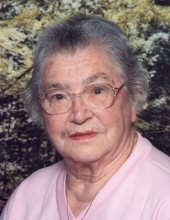 Frances E. Andrew, 92, Gettysburg, PA died Saturday, January 26, 2019 at Genesis – Gettysburg Center. She was born September 13, 1926 in Butler Township, PA the daughter of the late Howard and Bessie Huff Shultz. Her husband Kenneth R. Andrew died in 1998. Frances attended Freedom Valley Church in Gettysburg, PA. She was a member of the Barlow Fire Company and the Gettysburg Moose. She enjoyed Bingo, Mexican Train Dominos and bowling. Frances also loved to crochet for her family and friends. Mrs. Andrew is survived by three sons; Ronald K. Andrew and his wife Donna of Gettysburg, PA, Clarence L. Andrew and his wife Yvonne of Gettysburg, PA, Richard L. Andrew and his wife Wendy of Gettysburg, PA, eight grandchildren; Stephanie, Rebecca, Joshua, Louisa, Brandy, Blake, Brian, Ashley, nine great grandchildren; Spencer, Sawyer, Eli, Emerson, Luke, Lydia, Nadia, Damian and Destiny. Funeral Services will be held Friday, February 1, 2019 at 2:00 PM from Monahan Funeral Home in Gettysburg with Pastor Gerry Stoltzfus officiating. Interment will be in Oak Lawn Memorial Gardens, Gettysburg, PA. There will be a viewing at the funeral home on Friday from 12:30 PM until the time of the service. In lieu of flowers memorials can be made to Barlow Fire Company, 2005 Taneytown Road, Gettysburg, PA 17325. "Email Address" would like to share the life celebration of Frances E. Andrew. Click on the "link" to go to share a favorite memory or leave a condolence message for the family.